Czech glassblower factory Brokis presented its latest projects for the first time at Euroluce last week in Milan. LightLine, a new table lamps collection by Lucie Koldova celebrates the material of glass in every component. Flutes is a suspension light with great variability and style for hotel spaces, restaurants and offices also designed by Lucie Koldova. 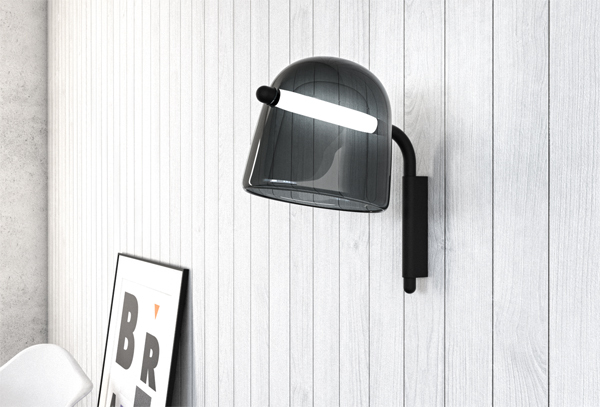 Mona exists now in a wall version and most popular Brokis lights finds new material and colors this year. Once again the Brokis mix : contemporary design + old bohemian glassblowing tradition, gives an impressive input to lighting market ! Pushing the boundaries of minimal design while extending the collection towards contract market. FLUTES by Lucie Koldova. Flutes were created as suspension project lighting for hotel spaces. Their potential and utility go far beyond the boundaries of the project specifications. As the name suggests, the simple and elegant, elongated conical shape was borrowed from a flute. The stylized openings not only allude to the source of inspiration for the design, they also fill a practical function – the variable cut of their edges for the suspension cable means that the angle of the entire lamp can be adjusted with ease. Flutes will be presented in several color gradients.The Flutes collection comprises three types of lamp according to the angle of tilt from 0° to 15° and 30°. LIGHTLINE by Lucie Koldova. 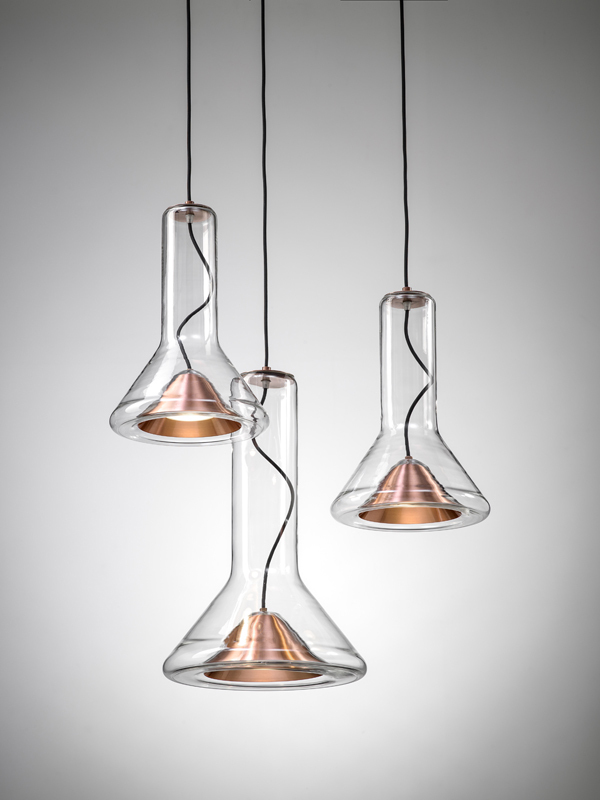 The Lightline glass lighting series celebrates the material of glass in every component. 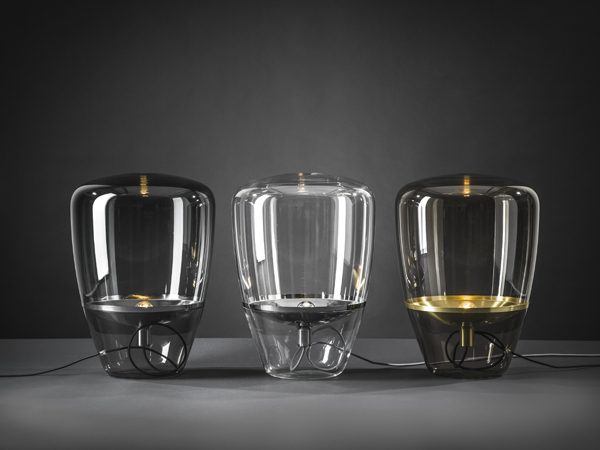 The design brings together three free-blown glass techniques in a single luminous and monumental sculptural object. The base, onto which the closed hand-blown glass body is fitted, is created by manually pressing glass into a cast-iron mold and forms a translucent anchor for the lamp. The design’s concept of a luminous line comes to life in the blown-glass body’s frosted plane, which in profile appears as a thin line. As the light source projects its glow upon it, a band of light emanates outward from the edge of the object. The lamps represent a collection of table projectors that cast a light of intimate character, the luminous line gently poised above the transparency of the glass body. 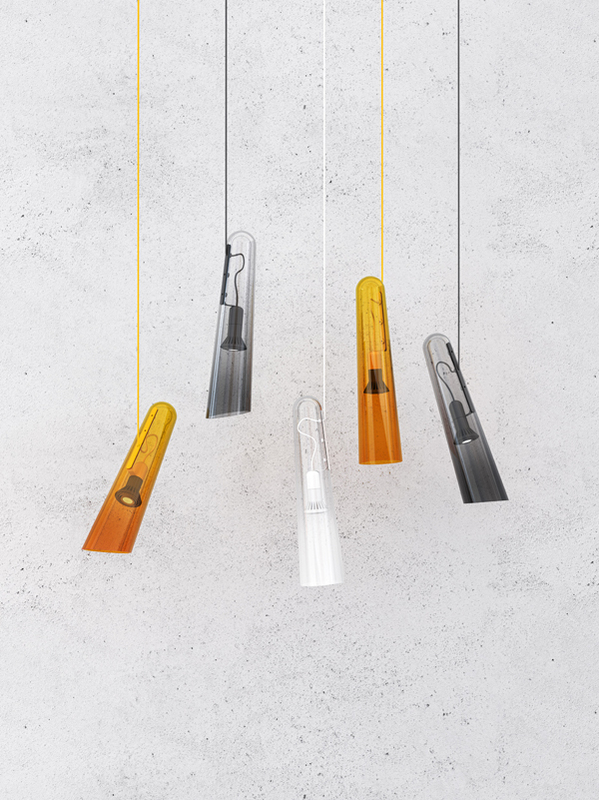 WHISTLE pendant light by Lucie Koldova. Whistle is a new, very contemporary story in the playful sensuality of the glassblower. Whistle is one of the nickname glassblowers give to the cane they use to blow glass. A rustic and solid tool that Lucie Koldova hollows out, revealing the full transparency of its interior with which she invents a hybrid form filled with the energy from the blowing and the light. Whistle is a simple luminous stroke, wrapped in a diaphanous shade embracing its vertical drop revealing it in its best light. The result is an equally technical and fun looking system, the skeletal electrics of which are highlighted by an essential and efficient choice of colours like the range of an offset printer. The seemingly simple implementation belies the expertise of Brokis for this entirely handmade series produced with industrial precision. The Whistle collection makes its debut with reflectors crafted in new materials : copper and chrome. BALLOONS by Lucie Koldova and Dan Yeffet exists now in chrome version. Balloon is a collection of simple and timeless “invisible volumes” that are originally based on an idea of a transparent balloon with a floating reflector. This series is compounded from one table model and two floor models creating an ambient artistic object. 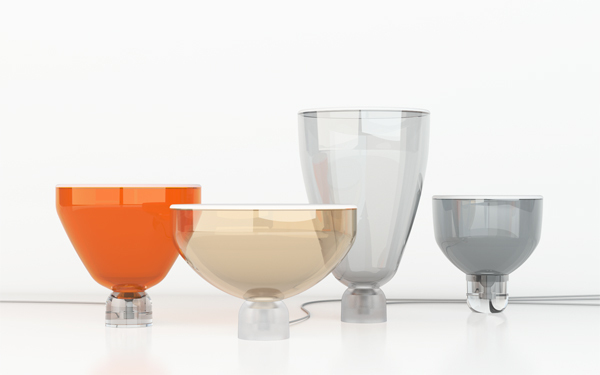 The biggest piece of the collection is pushed to the limits in a sence of possible dimensions of hand blown glass. MUFFINS by Lucie Koldova and Dan Yeffet finds a new wooden base made of American walnut and a new white finish. Muffins lamps are born of the notion of combining wood and blown glass. The design quality highlights the excellence of the materials and savoir-faire of choice producers. 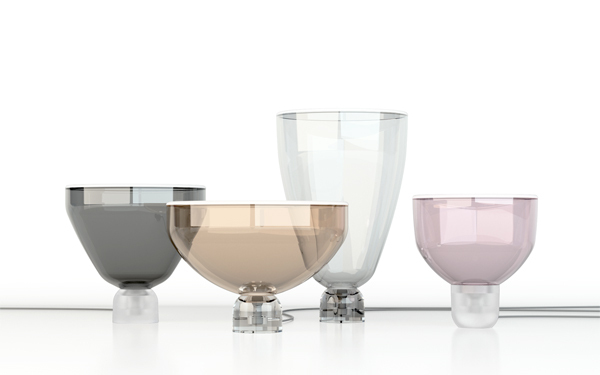 This series of Iamps creates a unique atmosphere through the glass” varied tones and tints, while retaining a complete functionality. MONA wall by Lucie Koldova is the latest addition to the exclusive Mona collection. 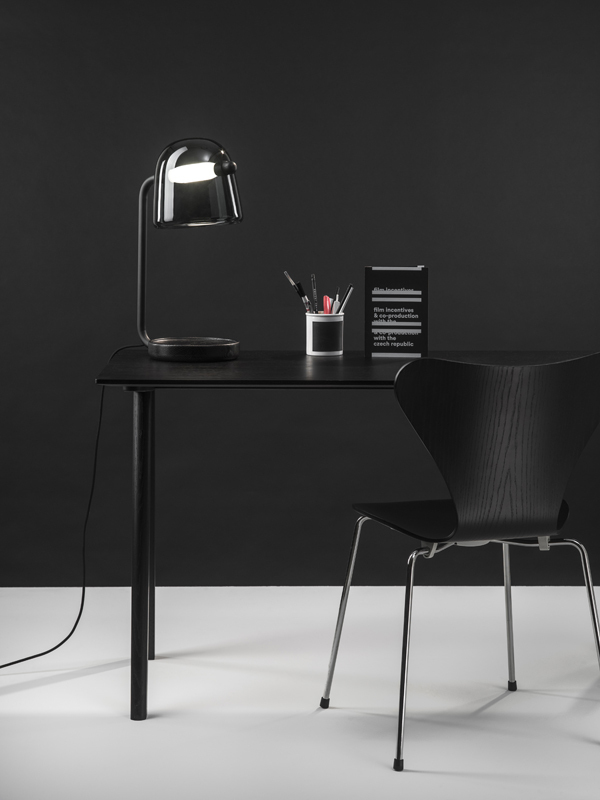 It joins the existing table, floor and pendant versions. It naturally sustains the singular character of the collection while, at the same time, expanding it with an entirely new type of light. The LED light source daringly pierces the delicate body of the lamp and illuminates the design’s thrilling tension, while the artist’s distinctive style is reflected in the unexpected combination of materials, dimensions, and precise craftsmanship. The LED light boldly cuts through the body of the lamp and underscores the excitement inherent in interfused glass forms. Brokis was founded in 2006 immediately creating a niche amongst contemporary firms by offering minimalistic lights that are exclusively glass, with transparent and innovative designs leading the way with the iconic table lamp Muffin (now over 2,000 sold per year). 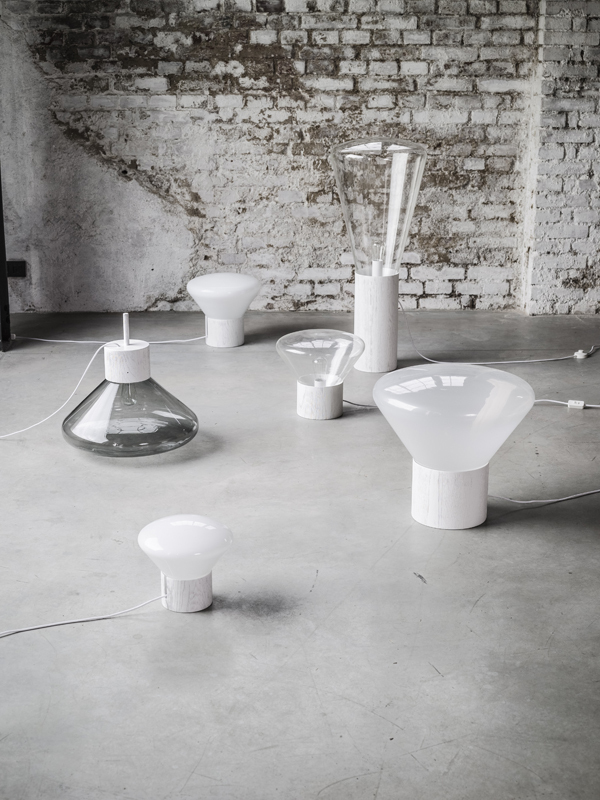 A single bulb, placed on a wooden base, like an explosion encapsulated in a disproportionate spherical glass cover later to become one of the hallmarks of the young Czech designer Lucie Koldova now artistic director of the brand. Initially a response to the 2008 crisis, it was paramount to reposition the expertise of Bohemian glassblowers in an ultra contemporary country where the players are not in such large numbers. Brokis as in broki, a Latino slang term used in New York by young people to hail each other, the equivalent of bro in black communities. A fruit of the double Czech and Puerto Rican origin of the founder, Jan Rabell, broki is also a term that refers to a small decorative glass piece amongst Bohemian glassblowers. 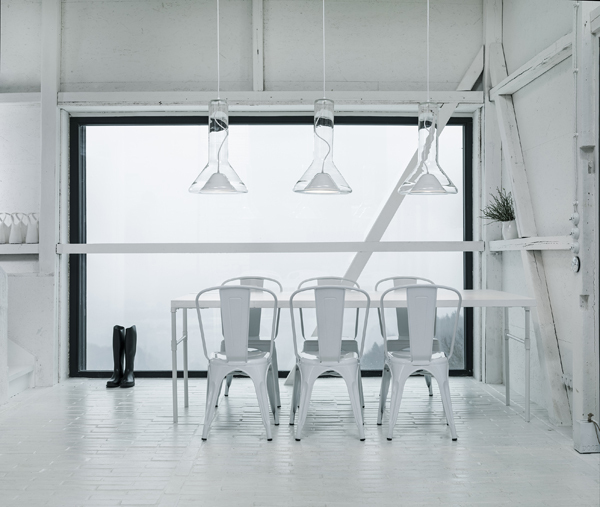 In four years, Brokis became a leading brand in contemporary lighting, blowing its products in the same factory as Flos, Artemide, Foscarini and Louis Poulsen in the Czech countryside 150 km from Prague. Unique expertise bordering industry and crafts, each Brokis piece passes between the hands of 25 people. Pieces comprise 3 successive layers of glass, the ultra-transparency of which imposes an inevitable quality control, as faults are made visible by the design. With 9 ovens and 72 people, the Brokis production site is currently undergoing expansion, devising products to recycle the glass offcuts dismissed by the principal line that were previously discarded. Lucie Koldova (born 1983) is a prominent designer based in Prague and Paris. Her work, ever pure and charismatic, focuses on furniture, glass sculptures, timeless lighting collections, and objects of desire; her portfolio ranges from daily-use products, poetic gallery objects, and limited series pieces to conceptual design. Currently, Lucie Koldova is the Art Director of Brokis since 2013.